Photograph: taken in Warsaw, 2013, photographer unknown. 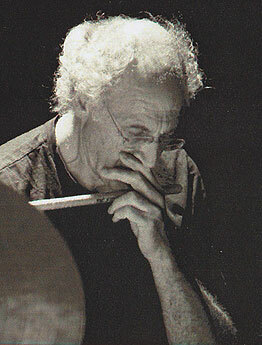 Born in London, 8 March 1947; Drums, percussion, live electronics. Played in London in the middle 1960s and early 1970s; was a founder member of the London Musicians Coop and the Aachen Musicians Cooperative. Has been building own instruments since 1969 (Incus 14 features Evan Parker on the lyttonophone), and had an exhibition of the equipment in Wuppertal in 1980. Since 1975 has lived in Belgium. Founded Po Torch Records in 1976 with Paul Lovens, with whom he has recorded three duo albums. Perhaps most well known in the UK and US as a member of the Parker/Guy/Lytton trio and, prior to that, for working in duo with Evan Parker. However, there are many recorded contributions to other groupings, most notably the London Jazz Composers' Orchestra and King Ubu Orchestru. In concert, a model of concentration. At a trio concert in Sheffield in 1994 Evan Parker outlined the course the evening might follow, saying that 'at some point Paul Lytton may take a solo and then again he might not'. This seemed to imply not just the organic nature that the improvisations would follow, but also the selfless nature of Lytton's contributions. Rusch, Robert D. (1996), Paul Lytton, Cadence, vol. 22, no. 5, (May), pp. 15-24. Vega, Lazaro (1998), Interview with Paul Lytton . Available as full text on this site. 1968,	An electric storm,	Island (Japan) PHCR-4856. White Noise. 1971,	Not necessarily English music,	EMF CD 036. One Parker/Lytton duo track by on this compilation CD. 1971/73/74,	Three other stories,	Emanem 4002. 1972/74/75,	Two Octobers,	Emanem 4009. 1972,	Collective calls [urban] [two microphones], Incus 5/psi 02.05. 1972,	Ode,	Incus 6-7/Intakt 041. London Jazz Composers' Orchestra. 1974,	Improvising percussionist,	FMRCD81-0501. Solos by Perry; Stevens; Lytton; Taylor; Prévost. 1975,	Live at the Unity Theatre, Incus 14. 1975,	Live at the Unity Theatre, psi 03.01. Re-issue of Incus LP with 2 additional tracks. 1976,	Ra 1+2, Ring 1016. 1977/1979,	The inclined stick, Po Torch 4. 1977,	Was it me?, Po Torch PTR/JWD 1. 1978,	Moinho de asneira/A cerca da bela vista a graca, Po Torch PTR/JWD 5. 1978,	Groups in front of people 2	Bead 15. 1978,	Laboratorio della quercia,	Horo HDP 39/40. 1980/1981,	The fetch, Po Torch PTR/JWD 8. 1983,	Hook, drift and shuffle, Incus 45 LP/psi 07.07 CD. 1985,	Ellispontos,	j.n.d. III-A. Paul Lytton, Hans Schneider, Floros Floridis, and Phil Wachsmann. 1986,	Atlanta, Impetus IMP 18617. 1987/1988,	Zurich concerts,	Intakt 005. London Jazz Composers Orchestra. 1989,	Harmos,	Intakt CD013. London Jazz Composers Orchestra. 1989,	Double trouble,	Intakt CD019. London Jazz Composers Orchestra. 1990,	Trend, Splasc(h) CD H 309.2 With Mario Schiano/Joëlle Léandre/Alex Von Schlippenbach and Evan Parker. 1992,	Binaurality,	FMP CD49. King Ubu Orchestu. 1993,	Imaginary values, Maya MCD 9401. 1993,	Portraits, Intakt CD 035. London Jazz Composers Orchestra. 1994,	50th birthday concert, Leo CD LR 212/213. Schlippenbach trio on one CD; Parker/Guy/Lytton trio on the other. 1994,	Breaths and heartbeats, Rastascan BRD 019. 1995,	The Redwood session, CIMP 101. 1995,	Three pieces for orchestra, Intakt CD 045. London Jazz Composers Orchestra. 1996,	Natives and aliens, Leo CD LR 243. Evan Parker trio ith Marilyn Crispell. 1996,	Toward the margins, ECM New series 1612. The Evan Parker Electro-Acoustic Ensemble. 1996,	The balance of trade, CIMP 114. Paul Lytton Quartet. 1996,	At The Vortex (1996),	Emanem 4022. Parker/Guy/Lytton. 1997,	Some other season,	ECM 1662. Wachsmann/Lytton duo. 1997,	At Les Instants Chavirés,	psi 02.06. Parker/Guy/Lytton. 1998,	Drawn inward, ECM 1693. The Evan Parker Electro-Acoustic Ensemble. 1999,	After Appleby, Leo CD LR 283/284. Parker/Guy/Lytton with Marilyn Crispell. 1999,	English suites, Wobbly Rail WOB009. Duo with Ken Vandermark. 1999,	Odyssey, Intakt CD 070. Guy/Crispell/Lytton. 1999,	Vanishing pictures, FMRCD76-0101. Vanishing pictures. 2000,	Inscape - Tableaux, Intakt CD 066. Barry Guy New Orchestra. 2000,	Transatlantic bridge,	Okkadisk OD12040. Territory Band-1. 2001,	Lit as from within, FMRCD113-i0303. Vanishing pictures. 2001,	Atlas,	Okkadisk OD12050. Territory Band-2. 2002, Globe Unity 2002, Intakt CD 086. Globe Unity Orchestra. 2002,	Memory/Vision, ECM 1852/038 1172. The Evan Parker Electro-Acoustic Ensemble. 2002,	Map theory,	Okkadisk OD12050. Territory Band-3. 2003,	In your shell like,	Emanem 4111. Paul Dunmall/Paul Lytton/Stevie Wishart. 2003,	Ithaca, Intakt CD 096. Guy/Crispell/Lytton. 2003,	SET,	psi 09.09. Evan Parker. 2004,	Oort-Entropy, Intakt CD 101. Barry Guy New Orchestra. 2004,	Free zone Appleby 2004,	psi 05.05. Barry Guy/Paul Lytton/Evan Parker/Joel Ryan/Philipp Wachsmann. 2004,	The eleventh hour, ECM 1924/987 0854. The Evan Parker Electro-Acoustic Ensemble. 2004,	CINC,	Okkadisk ODL10009. Lytton/Vandermark/Wachsmann. 2004,	Company switch,	Okkadisk OD12070. Territory Band-4. 2005,	New horse for the White House,	Okkadisk OD12080. Territory Band-5. 2006,	Zafiro,	Maya Recordings MCD0602. Parker/Guy/Lytton. 2006,	Topos,	Maya Recordings MCD0701. Fernández/Parker/Guy/Lytton. 2006,	Collide,	Okkadisk OD12090. Territory Band-6 with Fred Anderson. 2006?,	Nate Wooley/Paul Lytton, brokenresearch 028. LP limited edition release. 2007,	Phases of the night, Intakt CD 138. Guy/Crispell/Lytton. 2007,	Live in Antwerp,	Treader TRD019. Spring Heel Jack/Pat Thomas/Alex Ward/Paul Lytton. 2007,	The moment's energy, ECM 2066/177 4798. The Evan Parker Electro-Acoustic Ensemble. 2008,	Figures and grounds,	psi 11.05. Adam Linson Systems Quartet. 2008,	Asynchronous,	SLAMCD 283. Fred Van Hove/Paul Dunmall/Paul Rogers/Paul Lytton. 2008,	Harmos,	Intakt DVD 151. LJCO. 2009,	Creak above 33,	psi 10.02. Nate Wooley/Paul Lytton. 2009,	Scenes in the House of Music,	Clean Feed CF196CD. Parker/Guy/Lytton + Peter Evans. 2009,	Six feet under,	No Business Records NBLP46. Nate Wooley/Christian Weber/Paul Lytton. 2010,	Nightwork,	Marge 46. Parker/Guy/Lytton. 2010,	Hasselt, psi 12.03. Evan Parker Electroacoustic Ensemble. 2010,	Mad dogs, Not Two 902-2 (5CD set). Barry Guy New Orchestra small formations. 2011,	Live at Maya Recordings Festival,	No Business Records NBCD55. Evan Parker/Barry Guy/Paul Lytton. 2011,	Seven storey mountain III and IV, Pleasure of the text POTTR 1301. Nate Wooley. 2011,	Live at Maya Recordings Festival,	No Business Records NBLP60/61. Evan Parker/Barry Guy/Paul Lytton. 2011,	The Nows,	Clean Feed CF260CD. Nate Wooley/Paul Lytton. 2012,	Mad dogs on the loose, Not Two 925-2 (4CD set). Barry Guy New Orchestra small formations. 2013,	Amphi - Radio rondo, Intakt CD 235. Barry Guy New Orchestra. 2013,	Nine ways to read a bridge, Not Two 920-2 (6CD set). Ken Vandermark with trio of Lytton/Wooley/Vandermark on 1 CD. 2014,	"?" "! ", Pleasure of the text POTTR 1303. Solo. 2014,	Nahezu nicht, Creative sources CS 326. Nicola L. Hein/Paul Lytton.